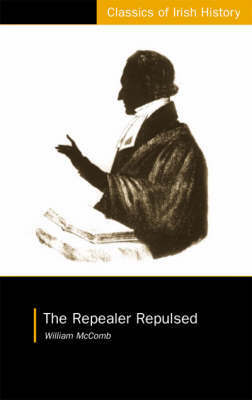 "The Repealer Repulsed" is an account of Daniel O'Connell's visit to Belfast in January 1840. Henry Cooke, the celebrated Presbyterian leader, publicly challenged O'Connell to debate Repeal during the visit. O'Connell refused to debate Cooke, partly because of his unwillingness to elevate his rival's stature but also for fear of violence. In contrast to O'Connell's usual triumphant rallies, the Belfast visit produced extensive rioting and the planned ceremonial welcomes for O'Connell in border towns were cancelled for fear of disorder. O'Connell himself travelled in disguise. Written and published in haste to discredit O'Connell, this book has been described as a foundation text of Ulster unionism. It contains one of the earliest statements of the economic case for Ulster unionism and provides valuable insight into the construction of political Protestantism.